I remembered how much I relied on music when I could not be at home with my husband due to work commitments. I downloaded a CD with songs that have always been in my musical repetoire over our many years of marriage. Songs from our "courting" days, from our wedding day, sacred music for spiritual solace, songs that have really meant something to both of us over our years together, and some that were just upbeat to help give me inspiration to keep going on difficult days. The one constant to remember when playing your favourite music, is to keep it loud!!! My solace is increased as I increase the volumn. All of us as patients or caregivers, need to take that time to find that solace. Regeneration is good for everyone and it helps to put our problems and adversities in a different perspective. 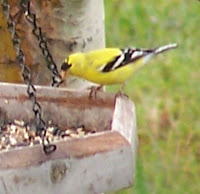 My husband loves to fill up our many bird feeders and watch as various fowl come to visit. It is relaxing to listen to their distinct calls and he's always amazed at the many varieties that frequent our property. Each of us has our own way of finding peace in our often turmoil world. It may be by taking a walk along a beach, or just watching your favorite sunset. If you are fortunate to live near the ocean, as we are, then listen to it's roar and watch the waves roll in. Maybe you have a f amily pet that provides hours of comfort for you and helps take your mind off your struggles. Spend time with nature and you will be rewarded. Each and everyone of us should take look at the little things in life and prioritize. We all live in a very fast-paced, hectic and sometimes way too busy routine. It is usually not until a health crisis suddenly comes into our lives, that we realize just what really is important and what should take priority. It's not the hours you spend at work, the amount of money you make or where you may take that vacation this year that should be the main theme of your life. It's the little things, and taking time to enjoy them should be top priority for all of us. Hope you enjoy the photos today and I trust you will take the time to spend time with family, find solace and smell the roses along life's highway. As you say, appreciating what is really important in life is what all of us need to do. Thanks for reminding me to not get so caught up in my everyday world. Wow! Double Wow! What a fantastic site you've created here. I am a caregiver to my husband and I am delighted to have discovered your website. Your experiences are so very similiar to how I've felt as well. Only problem is, I've never been brave enough to say anything. This is so true Debbie! We all get so caught up in our daily lives, we sometimes forget about what is really important to us. You have added words of encouragement for many on this website. Thank you! This is very true!!! Great job!!! Did you take this photos? They are amazing!